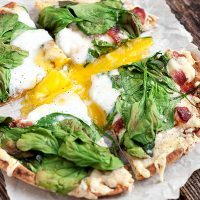 Easy and delicious, this Breakfast Pita Pizza is made easy with a pita bread crust, Fontina cheese, bacon, spinach and off course, a runny egg! Time and time again, my kitchen teaches me that the best things I eat are often the most simple things I make. 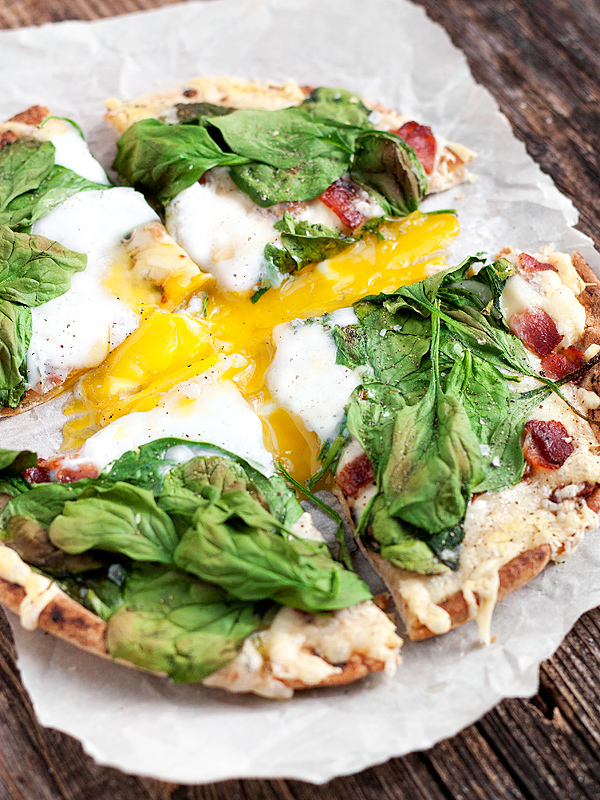 This Breakfast Pita Pizza is just such a dish. A few minutes of prep and 10 minutes in the oven delivers up one of the most delicious bites I’ve had in a while! 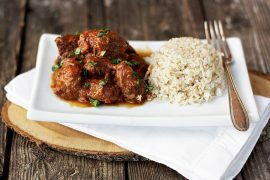 What makes this dish so perfect? Well first … runny egg yolks! (And I love my eggs really runny). Combine that with a crispy, baked pita (perfect for scooping up that yolk), nutty, melted Fontina cheese, a bit of salty bacon, some wilted greens and a finish of freshly ground pepper and a light sprinkling of Parmesan and you have a great way to start any day. It’s ideal if you happen to have some cooked bacon around, to make this dish even quicker, but even if you don’t, it cooks up quickly if you dice it first and cook in a hot pan for a few minutes. You can also use partially cooked bacon. Just crumble. It will finish cooking in the oven. Depending on the saltiness of the bacon and the cheese you use, you may not need additional salt on this dish. Taste first before adding any more. I guess it goes without saying that the choice of cheese is up to you. I love Fontina. It melts beautifully and it’s nutty flavour combines so well with the other flavours. Swiss, Gruyere, Gouda or a sharp cheddar or mozzarella would also work well. And I don’t think you could go at all wrong with a few bits of goat cheese on top of the spinach, for a bit of tangy cheese. Be sure to watch closely for the last few minutes of baking. You want to catch it just as soon as the egg white firms up and the egg yolk is still runny (as runny as you like it, anyway). You can give the yolk a little poke and see how much it jiggles. And here’s one for those who like their eggs a little less runny. A quick and easy warm breakfast, brunch or light dinner dish. Fontina cheese is lovely, but feel free to use your favourite cheese in this one. Swiss, Gruyere, Gouda, cheddar or mozzarella would all work well. Watch closely in the last few minutes of cooking to catch it as soon as the egg white is set, but the yolk is still runny. Serves 2, but you can obviously double or triple, as needed. Preheat oven to 475° F with rack in centre of oven. Place two pitas onto a baking sheet. Sprinkle with grated cheese and some crumbled bacon (you don't need a ton, just a bit here and there). Scatter a bit of red pepper flakes over top, if using. Break an egg in the middle. Bake in pre-heated oven for 5 minutes. Remove from oven and arrange a ring of spinach around the outside, avoiding covering the egg. Return to the oven and bake an additional 3-5 minutes, depending on how runny you want your egg. Watch closely so you don't over cook the egg. I like to give the yolk a poke and see how much it jiggles, to judge. Remember it will cook a bit more once it comes out of the oven. 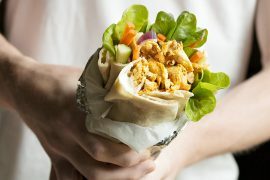 Meanwhile, place two pieces of parchment paper about the same size as a pita onto a cutting board (*Using parchment ensures that when you cut the pita, you don't leave all the great egg yolk behind on the cutting board!). Transfer the baked pitas to the cutting board, placing on top of the parchment. Using a pizza cutter or sharp knife, cut each pita into four pieces, cutting through the yolk. Transfer pita on parchment paper to a serving plate. Garnish with a bit of freshly grated Parmesan and some freshly ground pepper. Don't add extra salt until you've tasted it. You may find that it is salty enough with the bacon and cheese. During my crazy weekday nights, I often make pita pizza – love your addition of a good runny egg! Thanks Renee. I must say, the runny egg is easily the best part of this dish. Wow; this pizza looks seriously incredible! I’ve just recently learned to embrace runny egg yolks and the photos of it gushing all over this savory pizza look SO tempting. Gorgeous :) Pinning! I know what you mean about learning to embrace runny egg yolks. I didn’t always love them either. The nice thing about this is that you can cook it to your perfect runniness level :) Thanks for pinning, Alexandra! Oh this looks amazing! 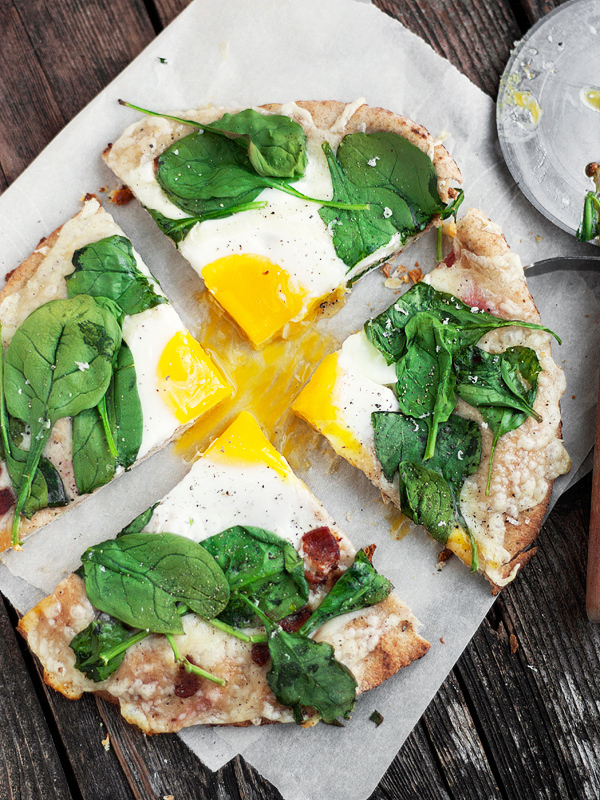 I love a good runny yolk, too, and breakfast pizzas are still something I haven’t really tried! On weekends, we sleep in and I will wake up so famished that I don’t take time to cook any of the wonderful, lingering breakfasts I have on my to-try list. We almost always have what I call Tortilla Breakfast: a large tortilla filled with whatever vegetables/beans/cheese/leftover meats/leftover rice anything we have on hand. And hot sauce. THIS is just as easy as Tortilla Breakfast! It’s Pita Breakfast. I love everything about it. Thanks Sophie. I’m the same way when it comes to weekend breakfasts (except that I’ve convinced my husband that making me bacon and eggs on Sunday morning is his ticket to “happy wife” :). Beyond Sunday though, I’m completely in lazy breakfast mode. 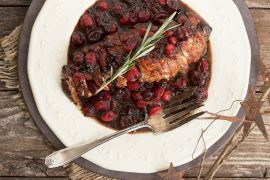 Trust me, you’d find this one just as easy and delicious! Eggs on a pizza is my absolute favorite! You should try the Fontina/egg combination, Chung-Ah. It’s perfect! 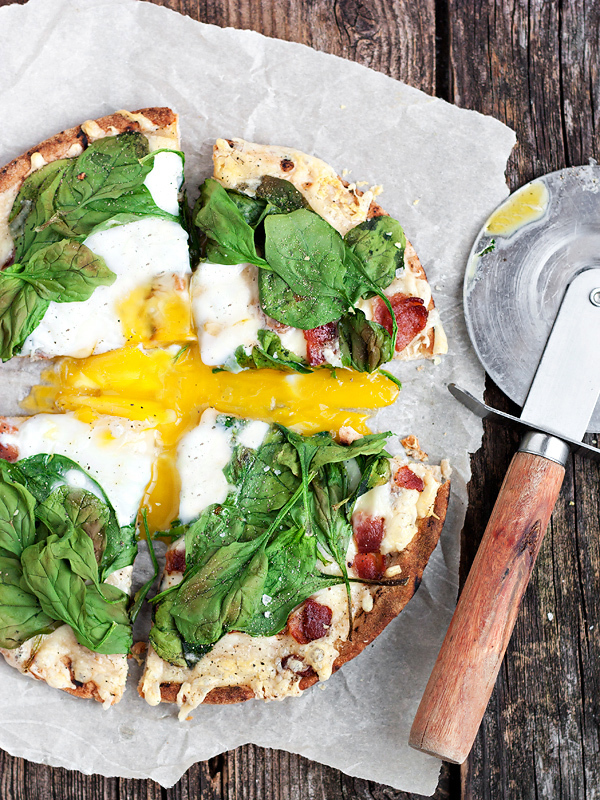 Pita pizzas are such a great way to get a pizza fix, this is perfect for a savory breakfast! It is perfect, Laura. I’ve eaten it the past 3 mornings!